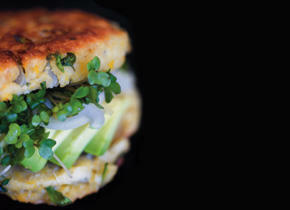 You can serve these on a bun, or turn the patty into the bun and stuff that with all sorts of good stuff. These make great do-ahead meals, and you can store cooked patties in the freezer. Sprout chick peas, or buy sprouted beans. Cooked or canned will also work. Stuff the patties with your favourite burger toppings or try some of these filling ideas: More sprouts, avocado slices, sweet onions, sliced Roma tomatoes, or a sprinkling of smoked paprika. If you are using sprouted garbanzos, steam them until tender, about 10 minutes. If you are using canned beans, jump right in. Combine the garbanzos, eggs, and salt in a food processor and puree until the mixture is the consistency of very thick, slightly chunky hummus. Pour into a mixing bowl and stir in the cilantro, onion, zest, and chopped sprouts. Add the bread crumbs, stir, and let sit for a couple of minutes so the crumbs can absorb some of the moisture. At this point, you should have a moist mixture that you can easily form into 1 ½ -inch-thick patties. Conversely, a bit of water or more egg can be used to moisten the batter. Heat the oil in a heavy skillet over medium-low heat, add 4 patties, cover, and cook for 7 to 10 minutes, until the bottoms begin to brown. Turn up the heat if there is no browning after 10 minutes. Flip the patties and cook the second side for 7 minutes, or until golden. Remove from the skillet and cool on a wire rack while you cook the remaining patties. Carefully cut each patty in half, insert your favourite fillings, and enjoy immediately, or serve between lettuce leaves.